The end is near! Wednesday marks the final day of school, with dismissal at 12:00 noon. In the evening, beginning at 7:00, is the closing program and awards ceremony, including high school graduation. Saturday marks the annual school picnic. Plan to arrive by 10:00; lunch will be at 11:30. After lunch, the school boys will want to try their hand at beating their dads in a softball game. We'll see how that goes. The Honor Roll Students enjoyed two tours this morning, before recreation at the Colonial Oaks gym. First, we went to Albrecht Cabinets, where Mr. Perry M. is Head Draftsman. He gave us a fascinating 45-minute tour of the showroom and manufacturing area. Some of the students got to play with laminate and contact cement. We all had to wear safety glasses, compliments of Albrecht Cabinets. We left the cabinet shop at 10:00, and went north to the Tallevast United States Postal Service Regional Sorting Facility, where Plant Manager Mr. Hickman gave us the low-down on what happens to mail when it leaves your box, what they do if the machine can't read the address, and how the USPS makes sure your mail is safe while it is in their hands. They sort about three million pieces of mail there every night, and around 300 people are employed to keep the equipment running properly. When the machine can't read an address, it takes a picture of the front of the envelope and sends the picture to Wichita, Kansas, where 800 people sit and look at pictures, then type in the address as best they can. This typed info gets instantly sent back to the Tallevast facility, where it is linked to the envelope; all this happens within several seconds' time! The USPS claims a 99%+ rate of accuracy on delivery, and they are quite proud of it. Mr. Hickman also reminded us that the U.S. Constitution guarantees the right to a fair, low-cost mail delivery service to every household in the U.S.A.
By the time that tour ended, it was time to decide on a place for lunch. By popular vote, the heavy favorite was Taco Bell. Afterward, we played games at the gym until Slurpee Time arrived. Field & Track Day was held last Friday, and turned out to be very enjoyable for everyone. The weather was perfect, the competition was well-matched, and the students showed good sportsmanship all the way through. Thanks to the school board and patrons for providing the delicious lunch; some said they would come again next year just for the food! It really was yummy - well done! Hat Day, Gum Day, Dress-Up Day - school has been so much fun lately for Miss Rosita's and Miss Rachel's students. Lots of creativity has been on display; one never knows who is going to come around the corner next: will it be a pirate or a princess? A cowboy or an Indian? A nurse, or a chef, or a gardener, or a Hawaiian teacher? Whether it is the comfort of studying on the floor with their favorite blankets and pillows, or the surprises that await when trading lunches with each other, February has been a lively month for these students. Also, Mr. Jason's class had a visitor from Illinois: Mr. H. W. Hostetler. He came and told stories about what it was like buying gas for 10 cents a gallon, growing up during the Great Depression, buying an acre of rich farmland for $25.00, and hunting rabbits (for food) in the snow with a single-shot shotgun. The students enjoyed Storytime with Uncle Herman. Our Second Annual Fundraiser Banquet was well-supported and a fine evening for everyone in attendance. The school board did a fine job in pulling it all together, and the students surpassed themselves in serving their guests. Mr. Alvin Zook came all the way from Virginia to offer his considerable talent in slow-roasting and barbequing the chicken and beef - for which we are thankful. He worked a splendid magic on the meats. Many of you helped behind the scenes to organize, equip, prepare, and fund the evening: thank you! We are especially grateful to everyone who showed their support, first by coming and enjoying the evening with us, but also by giving so generously to the school's financial needs. Your help is much appreciated! The Annual School Fundraiser Banquet is planned for Saturday, February 14, at 5:30 pm, at the Sunnyside Church Fellowship Hall. Tickets are now available! Contact Joshua, Kathleen, Tyler B., Yolanda, Rachelle, or Megan, or come to the School for tickets. Free tickets are required. Your donations will be accepted after the meal. Come enjoy a fabulous, professionally-prepared gourmet dinner of BBQ beef brisket, BBQ chicken, Grilled & Seasoned Baked Potato, Mrs. Miller's Famous Broccoli-cauliflower salad, green beans with bacon, and strawberry shortcake with fresh strawberries! It will be the pleasure of the Sunnyside School students and Board to be your hosts. We guarantee you will enjoy your experience! Honor Roll Students today went to the Sarasota County 911 Emergency Call Center in downtown Sarasota. Grant and Tracy were our tour guides, as they showed us a 25 minute power-point presentation in the official Sarasota Emergency Operations Center. From that enormous room they led us through another room filled with office cubicles where staff were taking 9-1-1 calls. We were allowed to listen to them take calls and give instructions, using their computer workstations with multiple computer screens to see maps, call histories, satellite images of locations, and so on. While we were there, a flood of calls came in so quickly that their supervisors had to jump in and help handle the calls. That tour took less time than was expected, so we went a little further downtown to the Selby Public Library, where we hung out for about 45 minutes. We admired the fascinating fish tank, browsed the Berenstain Bears selection, and generally relaxed and had a good time. After the library, we were off (by popular vote) to Taco Bell for a yummy lunch. After we'd eaten our fill and loaded up on as much caffeine as we dared, we headed straight for the gym for Extreme Kickball, Team Two-Square-ish, and Revised Volleyball... which was followed by a brief venture outside to roll down the hill, follow a trail through brambles, and build a pyramid. A Slurpee, of course, finished the day. Back to school, in 2009! We survived the holidays, and the first week back in school. Students are settling into their routines, and, with the Second Quarter already behind us, they are gearing up for a run at Third Quarter glory! Report Cards go out this week; please return them promptly. Today Miss Mast visited the older students' class room for nearly a half hour of stories about her life. After teaching school for 31 years in four states, she had lots to talk about. She also let slip a secret we'd never heard before: after earning her high school diploma, Miss Mast went to Eastern Mennonite College (now EMU, right here.) She noted that in those days, the ladies at EMC still wore head veilings and traditional cape-style dresses. When one student came to the cafeteria without her head veiling, the Dean of Women quietly told her she'd forgotten her covering, and the student rushed out of the room, embarrassed. Here is an interesting history article on EMC. Thanks, Miss Mast! You've inspired many people over the years. The Christmas Program is history! All the hard work, the memorization, the practice, the hours of standing still -- it all paid off. The students did a beautiful job with their singing and recitations, and they have earned compliments from all of us. Students, every one of you did a super job! You made the evening a pleasure, and lots of people in the crowd said they really enjoyed it. Thank you. You've earned a vacation! Take some time off, and relax for a couple of weeks. And, don't worry, it will be time for school again before you know it. (You can hardly wait, right? Right?) See you on January 5. 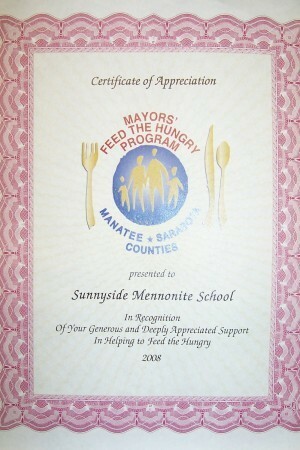 A Certificate of Appreciation arrived today from the Mayor's Food Drive. They wanted you to know they are grateful for your participation in gathering donated food for the less fortunate in our community, so they wrote a nice letter to say, "Thank you for feeding the hungry!" The Mayor's Food Drive ended today; it was an unqualified success because of the generosity of our students and their families. Seven boxes of food go out the door tomorrow morning, to the less fortunate of our community. There were pastas and pasta sauces, biscuit mixes and mac-and-cheese mixes, olives and Hershey's Kisses, pretzels and gummi worms, cake mixes and brownie mixes and soups... lots and lots of delicious foods to make someone's Thanksgiving happier. Thank you for blessing others. You are richer for it. Science & Art was a very enjoyable evening; the students did a great job with their projects! Lots of creativity was on display, and the range of ideas crossed everything from mind games to classic art. Olivia K. won the prize for Best Art Project, and Judson G. won for Best Science Project. Congratulations to both of you! A special thanks to the School Board for providing a pizza supper; they did a great job organizing it -- everything went so smoothly. Yummy food, lots of friends, youthful imagination on display: it all made for a memorable time together. The Mayor's Food Drive is underway here, and SMS is pleased to be helping with it. Every year, our students and their families give generously to help folks in our community who need groceries to brighten their Thanksgiving Day. 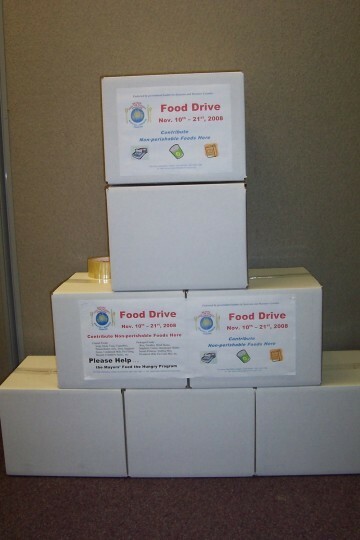 The Food Drive began this past Monday, and continues through Thursday, November 20. Already, we have a nice collection of canned foods, noodles, and other staples and goodies to bless other families. Would you like to help? Just bring a bag of nonperishable groceries into the school foyer, and we'll take care of boxing them and getting them ready for pick-up! The Honor Roll Students toured the Dakin Dairy Farm in Myakka today. They have about 3,000 head of dairy cattle on the farm, of which about 1,800-2,000 are milked every day. From about 60-75 pounds of feed per day per cow, they get almost three gallons of milk per milking per cow. Six or seven tractor-trailer loads of feed are delivered to the farm every week. Dakin Dairy is a sustainable farm; they re-use everything they can, making things like enriched topsoil/potting soil. They even cut fresh grass from their own fields twice a day to feed the cows! Yes, the cows get fresh-cut grass twice daily. We were shown the milking area, the feed lot, the rows of calves in their little pens, and we even got to see a calf being birthed! The hayride was next, and we went around to the back of the farm where we saw... more cows! Back in the gift shop, Karen let several students make butter, which they sampled on crackers. They were impressed. After the formal tour, we went to the Animal Barn, where the students got to bottle-feed calves. They also had goats, turkeys, guinea hens, sheep, and little pigs. The little pigs ran a race for us, much to our delight. The owners, Jerry and Karen Dakin, hung out with us for a little while. You might see them in some of the pics: he's wearing a brown shirt and brown hat; she's wearing a white shirt, and probably talking. Before we ate lunch, we had some free time to go through hay tunnels, climb Sand Mountain, and dig through the Fossil Mound for shark's teeth. After lunch, we piled back into the vans and headed to the gym at the park, where we played Team Two-Square, basketball, and Indoor Kickball. Yeah, it was great fun... but it wasn't complete until we got our Slurpee ™! A special guest visited the older students' classroom this morning -- it was "Story-Time with Mrs. Anna." As jolly and chipper as ever, she regaled us with stories from her time serving in the Basher Boys' Home in northern Indiana many years ago. She even showed us a birthday gift given to her from the boys in the home; their names are all recorded on the back of it. Born in New Mexico, she soon left for Kansas with her family because of crop failure. For her, the Great Depression is not merely a few questions on an American History test, it is the memory of making-do with the bearest of necessities, such as apple-butter bread and chocolate cake -- without icing! -- for school lunches every day. Anna, we enjoyed the sunshine you brought to our lives today! Thank you. BREAKING NEWS UPDATE! : More information about the Science & Art Festival has been posted on the Extra-Curricular Events page. Science & Art schedule has changed! Your calendars show Science & Art scheduled for November 7; because of a conflict on that date, Science & Art has been rescheduled for November 14. Please make a note on your calendars. 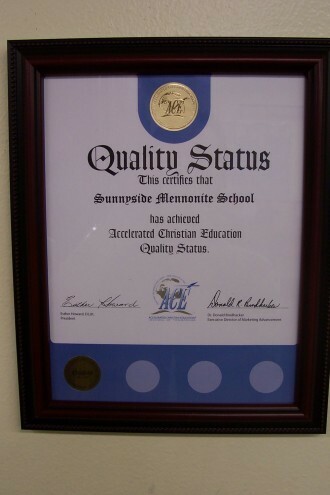 Accelerated Christian Education has awarded Quality Status to Sunnyside Mennonite School. Last spring two ACE representatives came and investigated our student records, checking things like PACE score averages and units completed. They also spent some time in the classroom with us, watching us work and even visiting briefly with some of the students. Before leaving, they told us that we may qualify to be ranked with their Quality Status Award. Because of the diligence and can-do spirit of your students, we are pleased to announce the reception of this award. Students, you earned it! Great work! Picture Day is coming up on October 29. 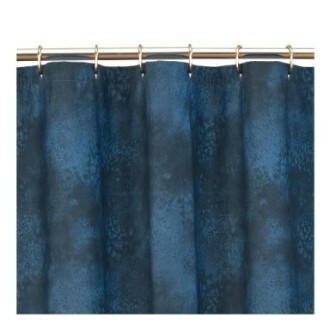 Since we know you want your children to look their very best, we decided to post a photo of the background we will use for their school portraits. If you would like to see the actual curtain, stop in at the school house and take a look. A page from history visited our chapel this morning: Mrs. Laura Y. gave the older students a short version of her life story! She told lots of interesting vignettes, including her first ride in an automobile -- a Model T Ford, when she was four years old -- and later learning to drive... in a cemetery. Or eating pumpernickel bread in milk for breakfast -- but only after the pumpernickel had been pre-soaked in water, to soften it. Or waking up on Christmas morning to find an orange, some candy, and perhaps new hand-sewn doll clothes as gifts from her mother and father. Later, during the war years, she worked in various types of voluntary service, including cooking in a hospital and cooking and keeping house for men in 1-W service. She has cheerfully lived a life of faithful service, and for that we honor her. School began today without Miss Rosita: she is on her way to Romania with her family! We expect a full report, complete with a photo slide show, when she returns. For chapel, we had a special guest speaker: former School Principal and Teacher, Bro. Mel! He brought Scruffy, too; they make a great team, and the students love them both. He talked about "bearing one another's burdens," and several students got to help Scruffy with the lesson. Miss Esther is filling Miss Rosita's role for the second and third grades; she's doing a great job, too! For lunch, we enjoyed a hot meal prepared by Joleen, and it was yummy! Lasagna, salad, applesauce, garlic bread, and southern tea to go with it. After lunch, of course, is story-time! The students like to just relax and have some down time before getting back to the studying, so this is always a favorite time of the day. And that's the way a day goes by at your school. Say, why don't you stop in soon, and spend some time with us in the classroom or on the playground? There is always something to do, so come on over for awhile... how about it? We'd like that. Really. You can see this day photo-blogged on our Snapshots page. The Honor Roll Students were taken to jail bright and early this morning. We were treated to a guided tour of the Sarasota County Jail in downtown Sarasota. Lieutenant Shaller showed us some inmates making meals in the kitchen, other inmates in their jail cells, more inmates on the jail roof exercising, and the chapel and Chaplain Frank's office. They also showed us lots of contraband that they have confiscated from inmates over the years. After that, we went to the Ninth Street boat docks, and wandered around on the rocks. There we watched a fisherman catch a 19" redfish. We also found a deceased crab, who was soon named Cadaver "Caddy" the Crab. McDonald's won the popular vote for lunch, then we played basketball and team two-square in the gym at the park until it was time for Slurpees! See it all on the Snapshots page. Kindergarten began today, with three thrilled youngsters trooping into their new classroom. Miss Rachel was ready and waiting, and she put them right at ease with her warm welcome. Congratulations, parents, on the beginning of another chapter in the lives of your families. You have our promise that we will do the best we can with your little ones. Hat Day was, shall we say, interesting. All kinds of hats, from regular baseball caps to sombreros, and even a hat that looked like it was built with leftover ostrich parts (it was pretty.) Check them out on the School Snapshots page. Monday is Labor Day; please don't show up for school. Enjoy the day off! Kindergarten begins classes on Tuesday. We welcome our newest students! Tuesday is also the day for the Honor Roll Students' Field Trip; they are all going to jail, and they can hardly wait! Hot Lunch on Wednesday, Moms. Just give your students a snack and a hug, tell them you love them, and send them off to school. The First Day of school is behind us! The Second Day of school has a question hanging over it: What will tropical storm Fay have to say about tomorrow's schedule? She is moving north, very much toward us, and the experts say she will arrive here tomorrow sometime. Our intrepid yet wise school board will continue to monitor Fay. They will call every student's home tomorrow morning, D.V., at about 7:15, to let us know if we should come to school. Welcome to the Friday Evening Parent-Teacher Orientation! Come meet the teachers, see the classrooms, and enjoy some time with friends! We are pleased to have Miss Rachel on staff with us, and we anticipate a good year working together with her. She will be teaching Kindergarten and First Grade. Miss Rachel enjoys children, has a great sense of humor, likes iced coffee drinks, and her classroom looks like a fun, cozy place for little scholars. Come check it out this Friday evening, 7:00 - 8:00.